Performers include: Blair Underwood, Pablo Schreiber, Spencer Grammer, Neal Bledsoe, Kenneth Choi, and Brent Sexton. On this police drama, no one’s tougher than NYPD Detective Robert Ironside (Blair Underwood). A brilliant, tough-as-nails detective who lives and plays by his own rules, Ironside is fearless and his instincts are second to none. When his spine was shattered by a bullet two years ago, he swore he’d never let a wheelchair slow him down. 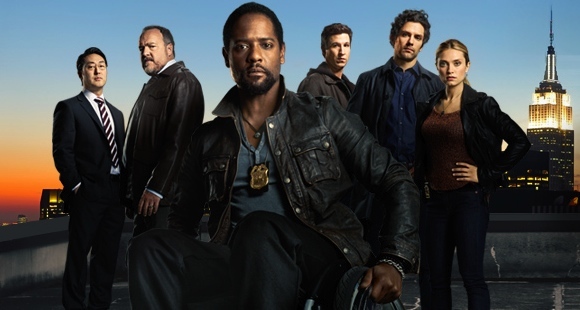 Ironside and his trusted, handpicked team of detectives each offer a unique background, perspective and skill set. That seems only natural since those around him have to stay on their toes if they want to keep up. Virgil (Pablo Schreiber) is a man who wrestles with the dichotomy of being one of NYPD’s toughest cops in the city, while also being a loving family man. At home, he teaches life lessons to his children but he doesn’t exactly follow those same guidelines in the line of duty. Holly (Spencer Grammer) is a strong and feisty detective who loves the rush of being undercover and the danger that goes with the job. She also has mysterious family ties to the Brooklyn underworld. Meanwhile, Teddy (Neal Bledsoe) is a rich, highly-educated young cop who has never been good with authority. He’s connected in a way that only those born who’ve been into wealth enjoy or understand. Their boss is Captain Ed Rollins (Kenneth Choi). A calm and pragmatic man, he handles situations with a level head and cool demeanor. He and Ironside share a mutual respect and admiration for one another — despite their push-pull relationship. Gary Stanton (Brent Sexton) is Ironside’s scrappy ex-partner and a hard-nosed detective. He marvels at Ironside’s will and ability to piece together his life after being shot. Together, this dedicated and capable group does whatever it takes to solve New York’s most difficult and notorious crimes. They won’t let anything stop them in their pursuit of justice. A car bombing leaves two people dead and the FBI singles out a problematic Columbia student as the suspect. However, Ironside’s suspicions fall elsewhere and a deadly game of cat and mouse lands himself and the team at risk when the bomber strikes again. First aired: N/A (released on iTunes on April 8, 2014). What do you think? Do you like the new Ironside TV series? Do you think it should have been cancelled? What an awful concept. I’m surprised some one was dumb enough to put it on in the first place. Fortunately the American public has better sense than to watch it. I enjoyed the new Ironside, they keep the dumb shows and cancel the good ones I really do not understand that. I hope that they reconsider and give it another try.